This is Europe's top shopping mall which is extremely popular attracting visitors to Sheffield from a wide catchment area. Tel. no. 0845 600 6800. You will find many leading department stores, exclusive shops, cafes of English and international cuisines, entertainments including an 11 screen cinema complex, The Oasis where additional entertainments including live music and shows can be found for free. Parking for Meadowhall is free for shoppers (check if you wish to park long-term) and it is ideally situated for the motoring visitor being right next to the M1 motorway at junction 34. It is also served well by train, bus and the Supertram network. Meadowhall has its own Meadowhall Shopping Centre Web Site. 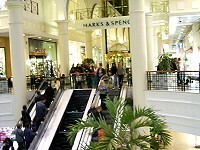 Sheffield city centre also has many leading department stores as do the centres of Barnsley, Rotherham, Doncaster and Chesterfield. A smaller version of the Meadowhall centre but with a charm of its own is the Crystal Peaks Centre (0114 251 0145) which may also be accessed by public transport including the Supertram and where car parking is free. Crystal Peaks also has a 10 screen cinema. Described as an "antidote to the High Street and Meadowhall" is The Forum which is situated a couple of minutes from the City Hall. here you will find 30 individual-style shops, a cafe bar, a comedy club on alternate Sundays and monthly art exhibitions from local artists in The Forum Gallery. Sheffield is world famous for its cutlery and you will find a factory shop at the Solly Street, West Bar premises of John Osborne Silversmiths. Goods of sterling silver, silver plate and stainless steel may be bought here. On similar lines is the factory shop of George Butler of Sheffield Ltd, Orgreave Drive, Handsworth, Sheffield. To buy cutlery online, see our own section at Sheffield Cutlery Store. Barnsley's market days are Tuesdays, Wednesdays, Fridays & Saturdays. The antique and collectors market there is on a Tuesday, Sunday market open 6am to 1pm and the Metropolitan Shopping Centre is open Mon-Sat 9am-5.30pm. Other markets in the Barnsley area at Hoyland, Wombwell, Goldthorpe & Penistone (ring 01226 772239). In Doncaster, you will find the Yorkshire Outlet, a new shopping concept of a retail village of 35 manufacturers selling leading brands at direct from the factory prices e.g .Black & Decker, Ravel, Lee Jeans & others. Nearby is the Doncaster Dome - maybe leave the kids swimming or doing sports there while you go shopping at the Outlet. Rotherham open air market is open on Mondays, Fridays and Saturdays. On Tuesdays there is a second-hand clothes market and a antiques/flea market on Wednesdays. Street markets can be found on Tuesdays in the centre of Rotherham.The indoor market opens Monday to Saturday. Other regular markets are also held in Wath, Rawmarsh, Dinnington and Maltby. Retail World can be found at Parkgate. This is a retail park with megastores and national names with food chains. Free on-site parking.